Dixon Hall Neighbourhood Services is serving up a second helping of Dixonlicious on Wednesday, March 30 from 6-9 pm at Daniels Spectrum. Thanks to the generous support of our sponsors, donors and guests, Dixonlicious 2015 raised over $65,000, allowing us to provide more than 10,000 meals to those in need in downtown east Toronto last year. Dixonlicious 2016 promises to be even more spectacular. Join us and experience a delicious food extravaganza featuring students from the renowned George Brown College Culinary Arts program, as well as chefs and restaurants from Regent Park, Cabbagetown, Queen Street East, Corktown and St. Lawrence neighbourhoods. Proceeds support our vital programs that provide food to those who rely on our services – Meals on Wheels, Homeless Shelters, Out of the Cold, At-Risk Youth, Alzheimer Day Program, HIV/AIDS Programs and more. 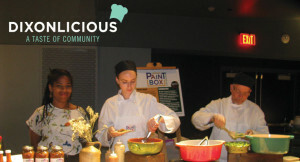 Guests will sample mouth-watering cuisine from an array of creative food stations set up around Daniels Spectrum. Food offerings are paired alongside a selection of fine wines, refreshing craft beers and spirits, carefully chosen to complement each scrumptious ‘bite’. Tickets are just $125 each or $75 for youth under 30 and include food, drinks and entertainment. For more information and to purchase tickets, visit www.dixonhall.org/dixonlicious.